We are continuing on our 30 days of prayer journaling journey. If you’re just joining us today is Day 11 in a series of 30 days of prayer journaling prompts. You can find Day 1 here and a summary of all 30 days will be here as we go along. 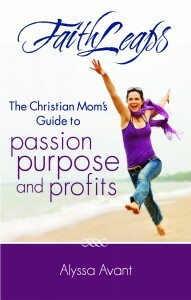 I have been sharing my prayer journaling story for the past several days. . . that part of this series started on Day 6. 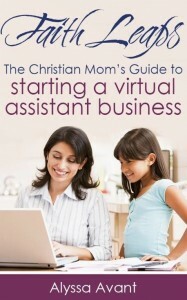 If you want to read my prayer journaling story from the beginning. Today is the last day of my story, but not the last day of this series. 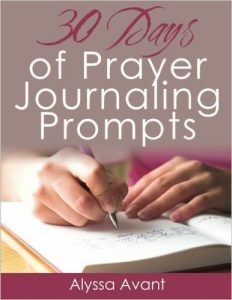 I will share a total of 30 days of prayer journaling prompts so you’re sure to develop the habit of prayer journaling. I want you to experience the difference it can make in your life. The rest of the story . . .
Because I gave him those few minutes each day I was able to hear him speak when he told me that my husband was “the one.” I had spent just a few minutes praying for our first date. I remember saying, “Lord, if this guy isn’t worth spending time on, please tell me, I don’t want to go through another heartbreak. I don’t want to waste my time on someone who I wouldn’t consider marrying.” I had just come out of a long relationship that had been an emotional roller coaster to say the very least. Because I spent time asking God his opinion, He soon revealed to me just how worthwhile spending time with that night’s date would prove to be. Then, another time, I prayed for months over a decision I had to make about college. I had for many years wanted to attend a Christian college, however, when I got there I was desperately homesick. 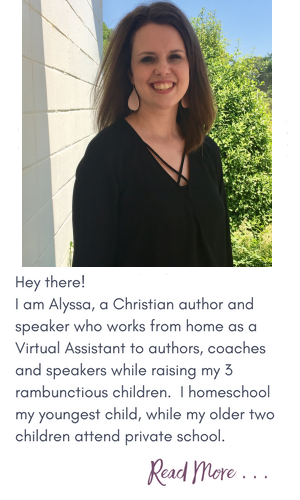 The Christian school I had dreamed of going to, though I enjoyed very much, was three hours from home and my anxiety levels were high as I sat all alone in my dorm room on Sunday nights after returning to school. With my mom, dad, younger brother and fiancée miles away, I sat there alone and ached to be with them. After many prayers and written chats with God in my prayer journal, I soon realized it would be okay to return home after just one semester at the Christian school to attend a secular community college closer to home. Because I took the time to write down my prayers, I was able to see what God was leading me to do, and how He was guiding the answers to my concerns and requests as I poured them out to Him time and time again. I am therefore grateful for the blank, white pages of each journal that my mom bought me – each of them empty but filled with amazing potential. They were an open canvas to be filled with my words – words that described my hopes, my fears, my dreams, and my aspirations, all of which I can now see God’s hand in, making my faith in today, greater than ever before. All because I took the time to spend some time writing notes to my Savior on the pages of a prayer journal. 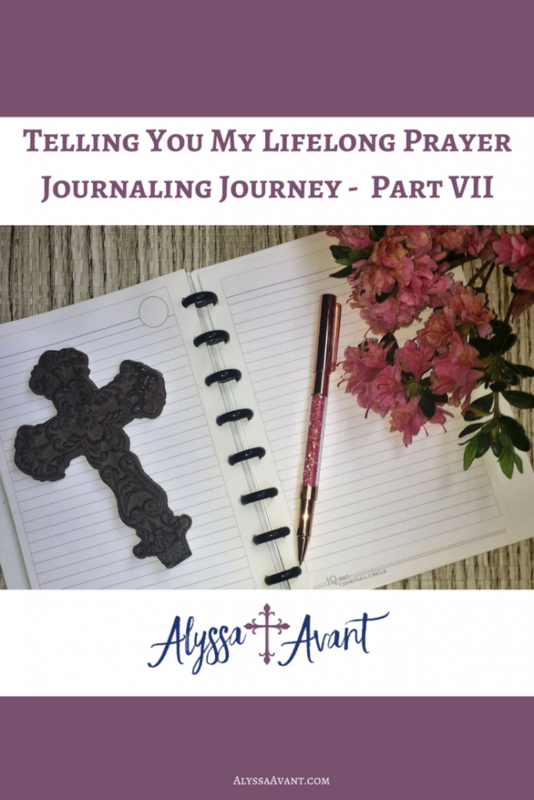 Now I challenge you to just start – – if you haven’t already started your prayer journaling journey today. Here is Today’s Prayer Journaling Prompt: Journal about what embarrasses you the most. What makes you blush? Reveal your thoughts on why you think this is. 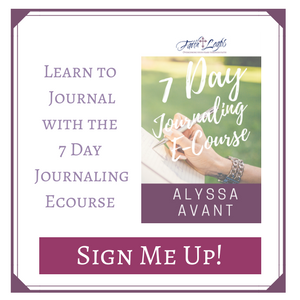 Alyssa, Have loved working with your journaling prompts 7 reading your posts. I did notice that you have a part VI marked as part VII in the bold heading. It’s been 2 months so you might already know about this. in which case I am sorry to bring it up again. This series is helping me with making an honest effort in journaling every day. Barbara can you tell me where the error is specifically?